Wedding dessert trends for every sweet tooth. Weddings and sweets have been intertwined for centuries. After all, both symbolize good fortune, wealth, fertility and, of course, happiness. The towering white cake is a perennial favorite, but why stop there? You’ve heard of this before—it’s called having your cake and eating it too. So grab a fork and dig into the sweetest trends in wedding desserts. Dessert tables are here to stay, with couples requesting ever more personal touches, like using Great-Grandma’s secret cookie recipe. 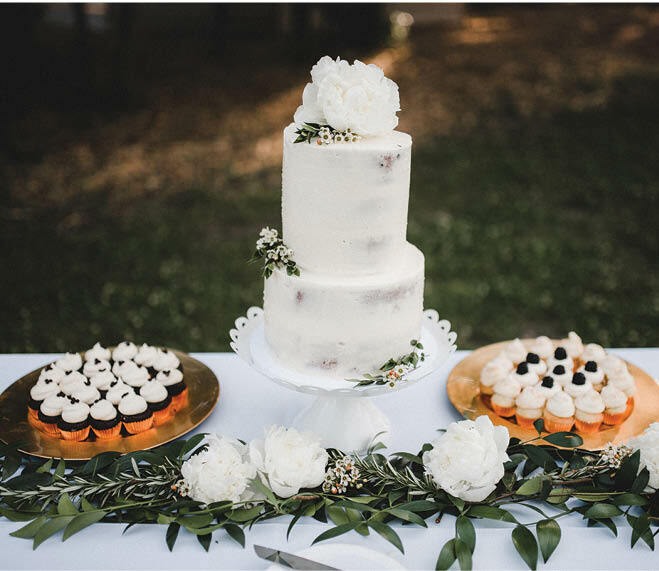 “Whereas dessert tables have historically been more composed and fussy, I see a trend toward more home-baked favorites,” says Rachelle Mazumdar, owner of Style-Architects Weddings + Events in Minneapolis. Couples are taking every opportunity to create experiences for guests at their wedding, and that includes desserts. “We’re seeing more interactive dessert buffets—s’mores stations, make-your-own sundae or ice cream sandwich bars,” says Amy Fuerstenberg, co-founder of Mi Mi Design in Minneapolis. She also suggests a snow-cone station where guests can choose their own flavor combinations. “Anything experiential at a wedding adds another layer of anticipation and fun to the evening. It’s another form of entertainment,” says Mazumdar. Frozen treats are a delightfully surprising wedding-day dessert, and local vendors are making delicious varieties and bringing them to venues in innovative ways. Jennifer Helm, owner of St. Pops in St. Paul, makes popsicles with organic sugar and local produce picked in peak season. “We get inspired by what’s available,” says Helm. That means flavor combinations like pear rosemary, raspberry lemonade, or rhubarb elderflower. “As for color, there is nothing more beautiful than the color of Minnesota berries or fresh watermelon,” says Helm. To bring the popsicles to you at their frozen best, Helm has a charming portable cart, complete with a red-and-white striped umbrella, that can serve up to 500 people. “We can work with the couple to create special flavors and custom labels,” she adds. Their green refrigeration technology allows them to deliver ice cream to groups from 50 to 2,000. Couples can choose their favorite flavors, then let the guests take over. “We bring the ice cream, homemade sauces like hot fudge, hot caramel and raspberry sauce, plus candies, nuts, whipped cream—the whole thing.” Including, you know, the cherry on top. Individually sized desserts continue their reign at the dessert table, and with good reason. “Couples like to let guests pick what they want,” says Danielle Bjorling, owner and baker at the Copper Hen in Minneapolis. Having an assortment of individual items means guests can sample a few items rather than just settle for one slice of cake. This is great fun for Bjorling, who has done cookies, individual mason-jar cheesecakes, fruit hand-pies, boozy cakes (see “Sweet Ideas” sidebar for details) and mini cupcakes. “Not to mention they are so dang cute,” she says. Individual desserts also offer more chances to tell your story as a couple says Tracy Kohler, owner and head pastry chef at Farina Baking Co. in Excelsior. “We love to customize and add personality to the table. Recently we designed favor cookies with the wedding hashtag so guests would use the hashtag on social media.” She also loves embellishing cookies or macarons with monograms or wedding dates. Macarons are a popular subject among bakers across Minnesota, including Amy Brace of Amy’s Cupcake Shoppe in Hopkins. “Not everyone has had the pleasure of enjoying a French macaron,” says Brace. “I love to hear how excited people were to try them for the first time.” These rainbow-colored confections are naturally gluten-free, since they are made with almond flour, then filled with a buttercream and assorted fillings like fruit curd or salted caramel. “They are also beautiful to display and the perfect little bites for after dinner, or as a take-home favor for the guests,” adds Brace. No matter what you serve after the meal, take comfort in the unanimous agreement of our experts: Everyone loves dessert. “Let’s be honest—it’s sugar! Everyone gets excited about sweet treats,” laughs Kohler. Our dessert experts dished up delights, and our writer delved and devoured. Behold: Even more innovative wedding dessert ideas, sure to give your guests the best kind of sugar high. - Cocoa & Fig Show your hometown some love with adorable state-shaped pies on a stick. They’ve done many of the 50 states, and a few countries, too. - Farina Bakeshop Have a thing for custard or pudding? Consider a lemon and blueberry verrine or a salted caramel budino served in tiny glasses. The names alone will melt on your tongue. - St. Pops Serve an ice-cold signature cocktail with a gourmet popsicle swizzle stick. - The Copper Hen Boozy cakes are tiny mason-jar cakes, topped with triple swirl of buttercream and a liqueur-filled pipette. Choose flavor combinations from raspberry peach to chocolate espresso Irish cream. - Mi Mi Design Host a cakewalk at your celebration. It’s a bit like musical chairs, but the winner receives a beautiful miniature cake to take home. - Glam Doll Donuts Torn between your undying love for cake and your fiancé’s affection for doughnuts? Try a tiered “doughnut cake” made from three massive doughnuts and live happily ever after.